They've found it; my theory refuted. That's good. Now to find the black boxes. I have a theory with some evidence on the disappearance of MH370 that I think should ruled out. There is one place on the ping ring map where an aircraft could be made to disappear, and this is if it were flown into an active volcano. I have deep interests in geology and (as an economist) game theory. I believe the reason MH370 has not been found, or any wreckage of it, is because the pilot has put it in a place where it will not be found. He knows the black boxes will survive any crash and will tell the truth: this would shame him (his good record) and his family. The only way to erase all information of the terrible crime is to bury the aircraft. The only way to do this is to crash it into a volcano. Before you think this is too crazy for words. There is a massive volcano on the last ping ring: within his endurance, and has been erupting since and around (maybe just before) the 8th of March 2014 from being quiet for some time. It is the massive 3400m Mt Slamet on Java. 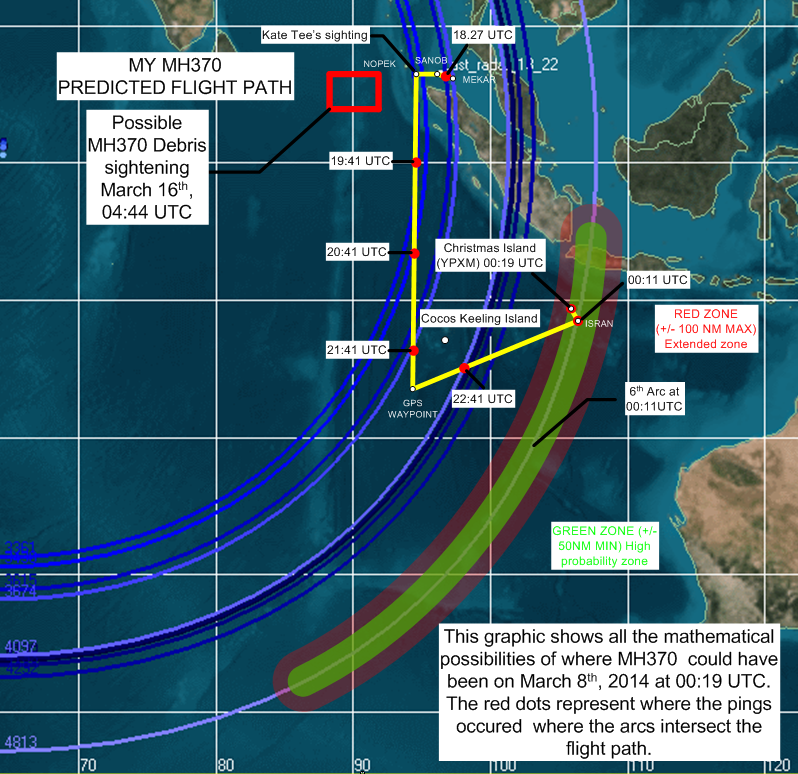 http://www.thehuntformh370.info/blogs/kstaubin (I do not support this mans theory, but I totally agree with his proposed MH370 track). On the morning of the disappearance the mountain (from what I understand) may have been out of bounds to hikers because of small eruptions days before. The mountain had been quiet for years before this. Did he know the mountain was awakening: if so, he'd know no one was on the mountain to see him come in. Did he have an interest in geology. All pilots in that area will know the great volcanos, they are a land mark and a hazard: he may have received a CAAS of NOTAM signalling the eruption. If he missed the summit, a crashed aircraft will mix with the eruption plumes. Slamet has been active for the last year. Put another way: on the last ping ring, where is the only place an aircraft could disappear without any trace? A volcano. It is plausible that he has evaded radar again (as he did earlier in the flight) and rather than gone south, has gone east, and then north as shown below (this is not my image. Anyone in the crew with interest in geology. Are there any searches from the crews computers - on the said volcanos? 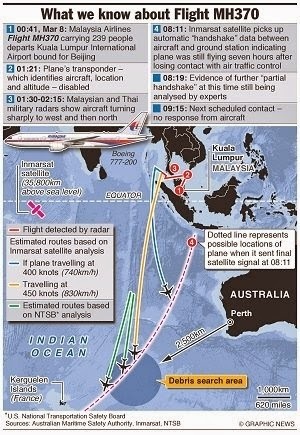 I have contacted and informed both the ATSB who advised me to also inform Malaysian Investigators with my theory. I have found a seismic record for Mt. Slamet for 2014 (below). 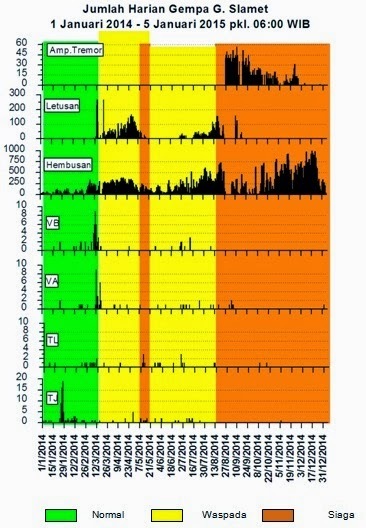 It shows an anomaly VB and VA (shallow and deep earthquakes on volcano respectively) on and around the 8th of March 2014. Was this triggered by and aircraft impact? Slamet has been erupting on and off for a year. On radar: I think they (he) could have got through radar. They don't pick up everything, and he must have got past Cocos and Christmas Islands also. After 12 months of no sign of MH370 – not even a piece of flotsam – I still think my volcano (Mt Slamet plunge) theory (I came to just days after the loss) is still plausible. I’ve tried to share it with the authorities, but well, it’s too crazy for words - isn’t it? The more I look at it, the more evidence points to it. Have you seen the ‘ping rings’? He could have flown my route, and the last ping ring is near the volcano. Mount Slamet (just left of central Java) was erupting on the day (and days before) no one was on the mountain. It was early Sunday morning when it would have gone in; all attention was in the South China Sea at the time – looking for it up there – so maybe they just missed it on radar near Java. Put yourself in his seat – assuming it’s the captain (he’s the most likely suspect) – where do you put this aircraft down so no one can ever know what you’ve done? Your nice guy, spotless 12,000hr record is over. How do you do this so there’s no shame on you, or your family. Black-boxes survive a lot! Plunges into land, and certainly plunges into water. But not plunges into the Earth. Gone, forever. Every time I’ve flown that route over Indonesia (many times now), the geologist in me comes out: I have my head out the window (when it’s clear) looking at those massive volcanos on Java. Awesome massifs. I’ve been thinking a lot about the disappearance of flight MH370 as I guess we all have, where’s it gone?! Being a bit of an ‘air crash investigation’ buff, here’s my theory for what it’s worth. If it’s a suicide plunge, then there’s no evidence of any wreckage to date - nowhere. I think they have plunged it alright, not into the sea or land, but into a place where it will never be found: they’ve plunged it into a molten volcanic crater - that way there will be no record of t...heir actions. So tonight I did a Google Earth search of the nearby volcanoes to where MH370 was last recorded/ lost contact: there are plenty of them to the south and south-east, but the largest and most obvious is Mount Slamet on Java, around 1.5 to 2 hrs. flight time. Turns out Mt Slamet has had (small) eruptions since the 8th (same day) and is now closed off to the public. In the dead of night they’ve flown down over the sea with transponders off. Mt. Slamet’s summit crater is said to be spectacular, and glows in the night. I would sure like to see seismic records of Mount Slamet, (or others nearby), 1 to 3 hour after loss of contact. 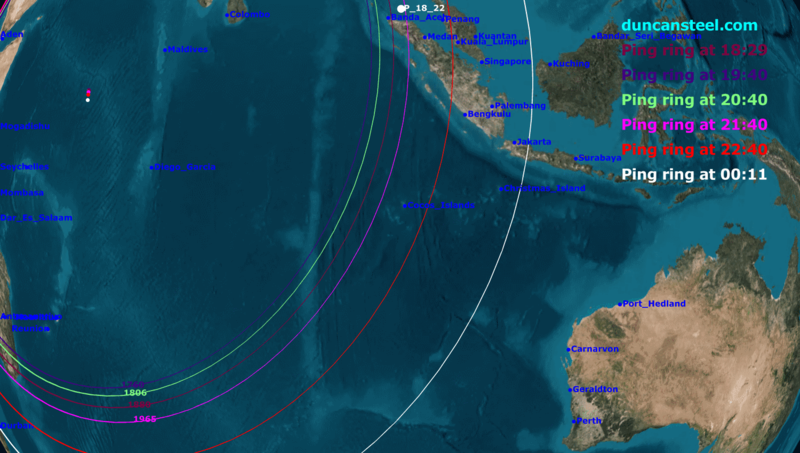 For my theory to be true, MH370 would have to have missed military radar off the coast of Java, unlikely. Given that the aircraft has still not been found, and no one has checked out my idea, I am now concerned and would like to draw attention to the officials. My theory is plausible given all the knowledge we have so we have to at least rule out rule it out. Mount Slamet (or others on the chain) is within the search range, and it did erupt on the 8th. Please check the seismic records and recent history of the volcano. I am only thinking of the families. "The Center of Volcanology and Geological Disaster Mitigation (PVMBG) recently announced that Mount Slamet has shown an increase of activity, marked by the increasing seismic activity and crater's haze. Visual observation on the volcano between March 8 to 10 showed that white haze can be seen at 25 to 1,000 meters high from the peak. The record on the seismic activity has also experienced a jump, with 441 tremors from March 8 to 10. There were also nine shallow volcanic tremors. PVMBG reported that seismicity at Slamet increased during 1-10 March, particularly during 8-10 March. 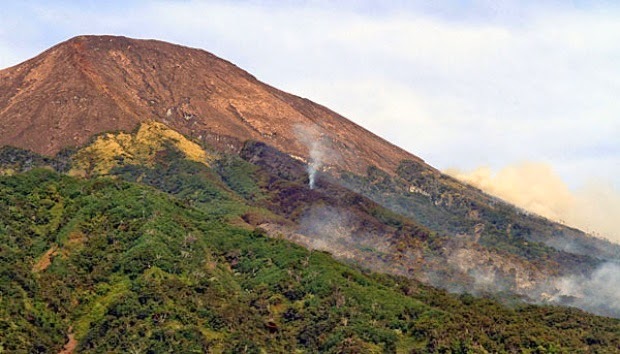 Observers at a post in Slamet Gambuhan village, about 10 km away, noted that diffuse to dense white plumes rose as high as 600 m above the crater during 1-7 March, and as high as 1 km during 8-10 March. The Alert Level was raised to 2 (on a scale of 1-4) on 10 March; visitors and tourists were advised not to approach the crater within a radius of 2 km. It's looking like they have the Aircraft on the ocean floor.